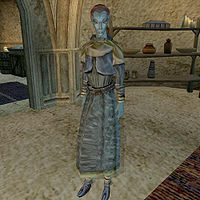 Tanar Llervi, a Dunmer enchantress, is an Associate of the Mages Guild. Tanar is found in the lowest level of the Ald'ruhn Guildhall, behind the closed door to the west, at the foot of the twin stairs. This page was last modified on 7 May 2013, at 17:34.